The wilderness canoe trails in the Okefenokee National Wildlife Refuge offer a unique experience in a National Wilderness Area. There are multiple trails available for varying degrees of experience; from one to five days in length. Each trail provides great opportunities for viewing wildlife in a pristine natural setting. 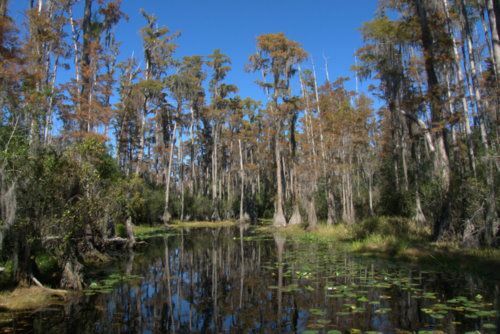 Visitors can canoe past alligators, black bears, egrets, sandhill cranes and many other species of animals in the cypress swamps and open watery "prairies" of the Okefenokee. The majority of the trail options start on the eastside of the refuge 7 miles southwest of Folkston, Georgia on off the Okefenokee Parkway South (GA 121/23). The wilderness canoe trails in the Okefenokee National Wildlife Refuge offer a unique experience in a National Wilderness Area. There are multiple trails available for varying degrees of experience; from one to five days in length. Each trail provides great opportunities for viewing wildlife. 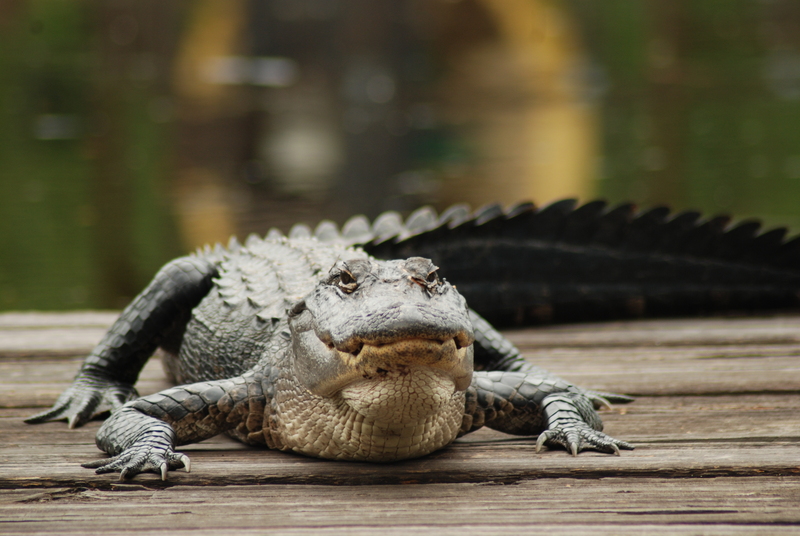 Visitors can canoe past alligators, black bears, egrets, sandhill cranes and many other species of animals in the cypress swamps and open watery "prairies" of the Okefenokee. 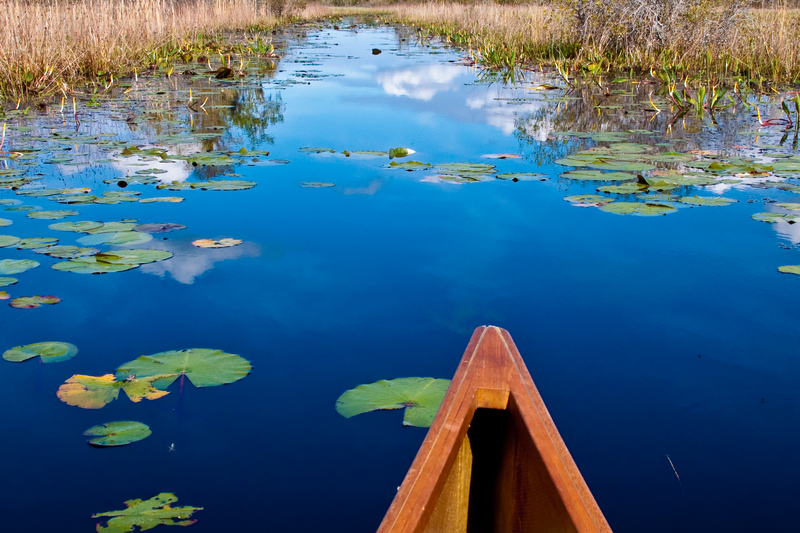 A canoe trip through the Okefenokee Swamp is an experience that you will remember for a lifetime. Alligators glide through the water stained dark with tannic acid. Herons and egrets wade through tall grasses and water lilies. Bears meander through hammocks and islands. Okefenokee National Wildlife Refuge is a haven for these and other animals—over 402,000 acres of wet prairies, cypress forests, and pine uplands. Most of the refuge is a nationally designated wilderness area which offers solitude and a primitive experience. Canoeing, kayaking, and motorboating are permitted year-round on marked trails. Visitors can enter the trail system from the Suwannee Canal Recreation Area, Kingfisher Landing, and Stephen C. Foster State Park. There is also limited access from the north in Okefenokee Swamp Park. Of the 120 miles of boat trails in the swamp, 70 are also open to day-use motorboats under 10 horsepower. The refuge concessionaire, Okefenokee Adventures, and rangers at Stephen C. Foster State park provide motorboat tours plus canoe, kayak, and motorboat rentals. 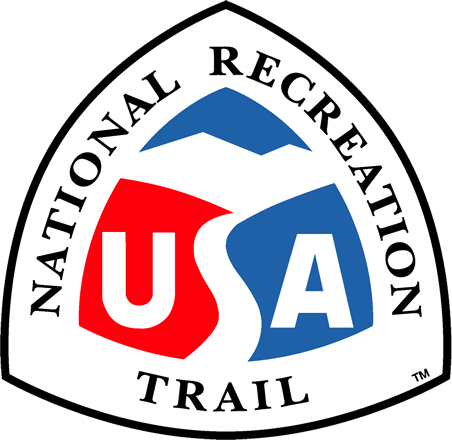 In 2010, 35,567 visitors enjoyed canoe, kayak, and motorboat trips on the trail system. The Okefenokee Wilderness Canoe Trails give visitors the opportunity to experience the solitude of wilderness while expanding the opportunities for wildlife observation, fishing, and photography by permitting overnight camping within the wilderness. During normal water levels, 12 different combinations of trips ranging from two to five days are possible. Seven overnight campsites are widely scattered along the boat trails. Wilderness canoe groups consisting of one to twenty people make advanced reservations and secure permits, which allow them to spend from two to five days in the swamp (one to four nights). Travel on these trips is entirely non-motorized and averages between eight and twelve miles of paddling per day. Four overnight campsites consist of wooden platforms about 20'x28' in size with a partial roof, table, and composting toilet located nearby. The other three sites are located on dry ground. Only one party per site reduces contact with other parties and promotes the feeling of solitude. One site is available to youth groups up to 25. Visitors must carry in all of their gear, food, drinking water, portable toilet for use in canoe, and cooking devices. “Leave No Trace Skills and Ethics” are required by the refuge. During years with normal water levels, reservations can be made up to two months in advance. Prolonged periods of drought can limit the availability of trails and campsites. The cost to visitors that use the overnight camping facilities is $10 per night per individual. Reservations can only be made by phone by calling (912) 496-3331 between 7 a.m. and 10 a.m. eastern time, Monday – Friday (excluding federal holidays). In 2010, 3,822 individuals used the overnight wilderness camping facilities on the refuge. Due to the limited number of platforms and the reservation system, an increase in use numbers is not expected. Increases would result from larger group sizes and expanding the use of the platforms during currently low use times. Environmental conditions (insects and heat) generally limit use during the summer months. Through the Wilderness Act establishing the Okefenokee Wilderness Area, the refuge is not allowed to expand the canoe system within the wilderness area beyond the 120 miles of existing trails. There is also limited space to expand the canoe system outside the wilderness. Alligator. Photo by Prajit Ravindran. Morning paddle. Photo by Debbie Biddle.